Without upgrading the storage device or its data transfer speeds there is a way to boost throughput in an AMC-based platform. 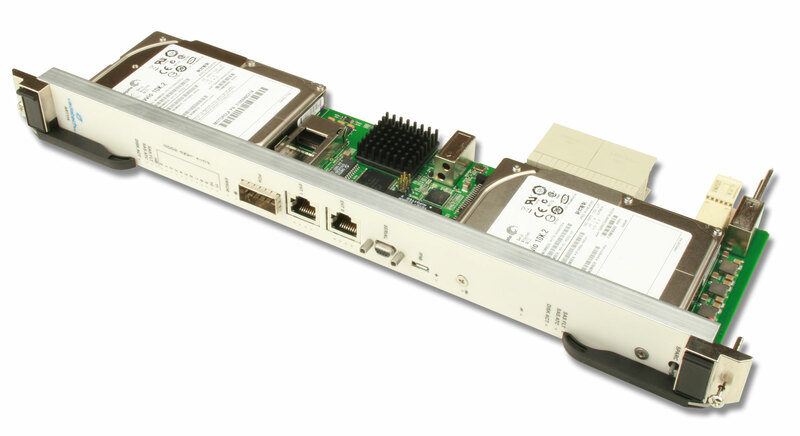 In the AMC specification, ports 2 and 3 are reserved for SAS and SATA data transfer across the backplane. This is more than adequate for many applications. To maximize performance, however, it is possible to use a host bus adapter (HBA) to move the signals across to the fat pipe region. In doing so, one can run the signals across from 2 ports to 4 ports, using PCI Express Gen 3 as the fabric, for example. The result is a data transfer of 12 Gbps for SAS and 6 Gbps for SATA. Figure 1 shows a single mid-size AMC RAID module with an HBA that is capable of implementing such a system. 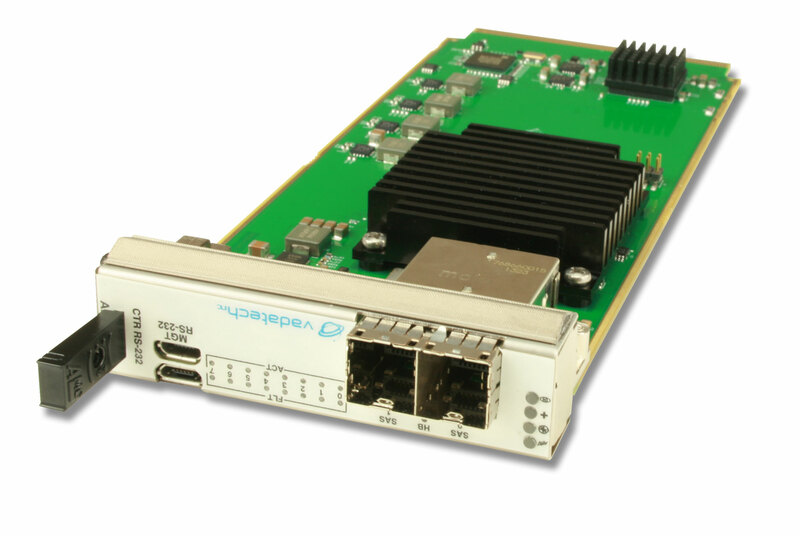 By using a host bus adapter (HBA) to migrate the signals across the fat pipe region, this module is 4x faster via the backplane than previous revisions. Using the same AMC design described earlier, a RAID can be implemented for massive amounts of storage. Of course with a RAID the system designer has discretion whether to use striping, mirroring, or various other options. This allows him to focus on speed or reliability, or trade off between the two. Depending on the risk tolerance of the application and amount of backup/redundancy needed, the designer can implement RAID 0, 1, 3, 6, and so on. Mil/Aero and other applications will require a more rugged solution. Using a solid-state disk (SSD) is an obvious choice, as it does not have the moving parts of a rotating disk. Two 2.5¨ SSDs can fit on a AMC (single module) and be used without an HBA (Figure 2). As the storage density of SSD technology improves, so this approach becomes appropriate for a wider range of applications. Two 2.5¨ solid-state disks (SSDs) can fit in a single-module Advanced Mezzanine Card (AMC), and the front module can be separately removed. There are additional steps available to meet the high shock and vibration of MIL/Aero and other applications. Adding standard µTCA.3 or µTCA.2 wedge lock clamshells achieves a rugged and secure format. The µTCA.2 option provides air channels for hybrid air/conduction cooling, while the µTCA.3 version is for fully conduction-cooled applications. Both variants securely locate the AMC, ensuring the backplane connector achieves the same level of performance as other Mil-centric standards such as OpenVPX. Another advantage of the clamshell is the ability to have Level 2 maintenance (L2M), since the circuitry is effectively protected from electrostatic discharge (ESD). In some applications, there is the desire to remove stored data. The most obvious reason is to support data backup or portability. But in Mil/Aero applications, data security is also often a driver for this requirement. Where sensitive data cannot be retained within the equipment, it is necessary for the HDD/SSD to be removable (while removal of the complete AMC is an option, limitations on the make/break cycle count of the backplane connector tend to make this impractical). We have discussed storage solutions in the AMC form factor, however the design principals are easily applied across other architectures. As ATCA can utilize AMCs, you don’t have to take up a front payload slot to add storage modules in an ATCA system. 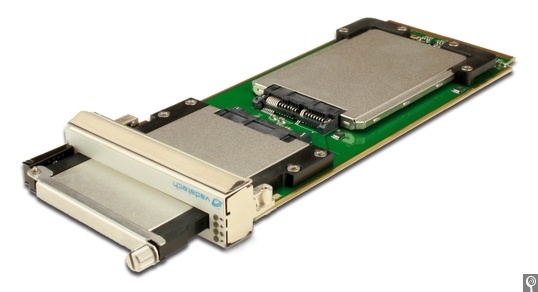 As shown in Figure 3, an ATCA rear transition module (RTM) can hold dual 2.5¨ SAS/SATA disks. PICMG-based systems continue to advance with creative, high-performance storage solutions in true commercial off-the-shelf (COTS) architectures. The result is a cost-effective, scalable selection of products that is highly versatile. Justin Moll is Director of Marketing at VadaTech.